NSAIL’s Nationalume, the hot-dipped coating product is comprised of 55% aluminum, 43.5% zinc, and 1.5% silicon. This product is known by many different trade names throughout the world. Nationalume is one of the preferred names. The product is also used as a substrate for prepainted sheet and this use has also grown significantly. The ASTM product specification for 55% Al-Zn coated sheet is A792/A792M, and the prepainted sheet version is specified in A755/A755M. The resultant products are far superior in terms of adherence to zinc coating and surface finish. Furthermore, they meet international standards such as ASTM, JIS, EN and Australian as well as Indian standards. [Corrosion performance data comparing the performance of 55% Al-Zn with galvanized coatings indicate that the performance is superior than galvanize coatings in all three types of environments– marine, industrial and rural. 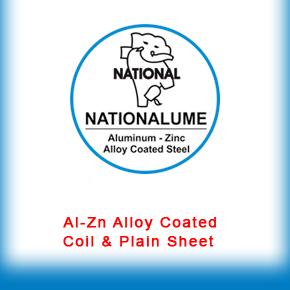 The unique dendritic structure of the alloy coating is now widely recognized as the primary reason for the improved corrosion resistance of the 55% Al-Zn coating. When it is exposed to the environment, the zinc rich areas corrode first. Since these areas are located in a labyrinth of interdendritic regions in the coating, the products of corrosion tend to fill the interdendritic interstices and the corrosion rate decreases. This leads to a flattening, parabolic corrosion rate curve in most environments. This contrast with the linear behaviour typical of galvanize. 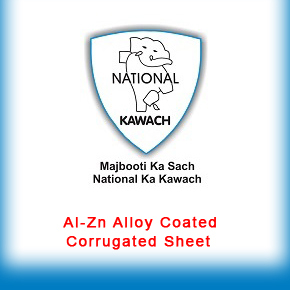 Corrosion of a 55% Al-Zn coating is therefore not the uniform thinning process of a galvanized coating.